Stories and songs, art activities, games and play for families with children of all ages. You are invited to come celebrate FishWise's 15-year anniversary! Enjoy live music by Santa Cruz's own Getaway Dogs, food and craft beer! Hosted at our office, this is a fun, social networking opportunity, and a family-friendly event open to all! We will also have ocean-themed art for your enjoyment in honor of Santa Cruz's First Friday. Come meet FishWise staff and learn what this local Santa Cruz non-profit is doing nationally and internationally to create lasting change by bringing socially responsible and environmentally sustainable seafood to your plate. The Santa Cruz Surf Film Festival is back for its third year, bringing four different screenings of incredible surf storytelling. Each screening will present a new collection of shorts and feature films curated from around the world, showcasing stunning cinematography, mind-blowing surfing, and captivating stories. These films will take you from our own backyard to some of the most remote spots on the planet, and show you surfing from new and innovative perspectives. Get ready to get stoked! This year the Tannery World Dance + Cultural Center celebrates the African Diaspora during the 2018 World Arts Festival on October 13th & 14th. Once again, we are lucky to have Festival artists join us at the library for free Family Festival Days workshops. All ages are invited to these free workshops. This is a free event. Monterey Bay Youth Outdoor Day is a nonprofit organization that helps families get outside and get active. Our goal is simple, lets get our youth back outside and active! We believe that we live in a unique and amazing region and because of that it is important to teach our children to cherish it. We are looking to encourage youth to be healthy through outdoor activities and build a better place for the future. In hopes of achieving our goal we hold an annual event at the Santa Cruz Fairgrounds where various companies and organizations can showcase their specialties. The event is totally free and we also raffle off dozens of prizes to the youth in attendance to inspire them to participate in the outdoor activity that they find most appealing. "Join us for our annual Oktoberfest at German American Hall in Santa Cruz. Enjoy beer by New Bohemian Brewery, live music by Zicke Zacke Band and some traditional German food. "Get your ticket while you can!" The town of Felton is 150 years old, and townsfolk are gearing up to throw a grand anniversary bash. The town party will include historical presentations of Felton's early days, which will be on display at Felton Community Hall and the Felton Fire Station, 4 bands, dancing, various other entertainment and of course, lots of local food and drink, shopping, kids events, crafts and more. The 150th celebration will be on Saturday, October 6th, from noon to 6pm at Kirby Street & Highway 9. At noon sharp a specially formed Felton Colors Honor Guard, comprised of Felton's own Boy Scouts Troop 604, Girl Scouts, and local 4-H members will be retiring and replacing the Felton Fire Station's Old Glory, as well as raising the Felton Sesquicentennial flag. Please join us for this commemoration and celebration of our town's history. Felton is named after John B. Felton, an anti-prohibitionist attorney and one of the first Regents of the College of California. The town was the early logging terminus for the timber cut farther up the San Lorenzo Valley. Already, dozens of volunteers are working on the plans for the celebration, but more volunteers are needed and welcomed. To join with your neighbors to help with or contribute to this fun event, please contact Mary Andersen at 831-335-6500. The Felton and surrounding communities are invited to bring their historical items to put on display and share. For display space, please contact Ronnie Trubek rtrubek@aol.com. Step into the incredible world of steam power at the Harvest Faire & Steam Festival presented by Kinetic Steam Works and Roaring Camp Railroads. Welcome Fall with heritage children's activities like scarecrow making, pumpkin patch picking, candle making and gold panning. Behold a variety of steam and belt-powered equipment on display. Admission is FREE for the whole family September 30th and October 1st and children with a Steam Train ticket get to pick out a free pumpkin from our Harvest Pumpkin Patch on Bear Mountain. Purchase Steam Train Tickets Here. Learn more about combining Art and Science through the CASE Art Club October 17th from 2:00 PM-4:00 PM at the Scotts Valley library! CASE stands for Creative, Artistic, Scientific, Expressive. A new monthly class for kids ages 6-10. Come craft with Anna and learn about the relationship between art and science. The goal is to involve kids in art using their own creativity. Parents are welcome to observe and learn but the art is for the kids. Beth Pratt-Bergstrom, the California Director for the National Wildlife Federation, will share excerpts from her book, When Mountain Lions Are Neighbors: People and Wildlife Working It Out in California, at a special event at Wilder Ranch State Park on Saturday, Oct. 6. Her book explores the evolving dynamic between humans and animals. Members of Friends of Santa Cruz State Parks (you may join at the event) and the Santa Cruz Museum of Natural History will be able to buy the book at a discount. The event is 4-6 p.m. and is free. Parking at Wilder Ranch is $10 and supports the park. Wilder Ranch State Park is at 1401 Coast Road, Santa Cruz. The Think Local First Indie Biz Expo is a celebration of local businesses and their products and services. Local businesses from across Santa Cruz County are coming together to promote the many benefits of shopping, buying and thinking local. There will be many booths put on by Think Local First Members showcasing a wide variety of goods and services for businesses. In recognition of California Leatherback Day, the Sanctuary Exploration Center will host an evening event to highlight the conservation efforts of the critically endangered Pacific Leatherback Turtle on Friday, October 12th from 5 PM - 8 PM! Families will be invited to participate in Leatherback art activities, such as DIY Leatherback wood-block printing, creating turtles and jellies from recycled materials, mini painting workshop, and will be able to dress up in a Leatherback turtle costume! The event will offer sustainable fish from Ocean2table and refreshments for purchase. Featuring: 20-minute talks by Leatherback turtle scientists, an award-winning Leatherback short film by Dutton Media Productions, a life-size Leatherback turtle cast, and Leatherback art activities, such as DIY Leatherback wood-block printing, creating turtles and jellies from recycled materials, and a mini painting workshop. Bear Creek Octoberfest will feature tasty beers, sausages and kraut as a community mixer and fundraiser for the Bear Creek Facility and Pool. Come have fun, mix and mingle! This Saturday, Oct. 13, 10AM-2PM, join us for the long-awaited GROUNDBREAKING of LEO's Haven at Chanticleer County Park, Santa Cruz County's first inclusive playground children of all abilities! The County of Santa Cruz, Chanticleer Park Neighborhood Association and the Santa Cruz Playground Project are hosting a community festival featuring oversize lawn games, pumpkins, music, craft stations, food trucks, a book giveaway and a picnic area. Imagine! Eating lobsters under the redwoods in support of State Parks! "Join us at the 24th Annual Lobster Feed Fundraiser! "Twinkling lights under a canopy of stars, the delightful sounds of live music floating through the air - it's that time of year again! Join us on Saturday, October 13 for a great time for great cause. Be sure to buy your tickets early as this event sells out every single year! "Proceeds go to support environmental and cultural education programs at Henry Cowell and Big Basin Redwoods State Parks." Visit Mountain Parks Foundation for ticket sales at www.mountainparks.org or call (831) 335-3174. Proceeds go to support environmental and cultural education programs at Henry Cowell Redwoods and Big Basin Redwoods State Park. For more information, please call (831) 335-3174, or email redwoods@mountainparks.org. Learn about some of the early settlers in the area as we hike 6 miles roundtrip through pristine redwood forest to the Page Mill site and back. As wildflowers disappear, mushrooms begin to emerge from the depths of the duff, and many of the forests creatures welcome the change of pace as fall approaches. Hike with a state park interpreter and a Portola and Castle Rock Foundation board member to explore the understory of this marvelous place. Bring hiking or running shoes, water, snacks, and a headlamp or flashlight. This moderate hike will likely take all afternoon, so please prepare accordingly. Event is free; day use vehicle fee is $10. Meet at the visitor center. 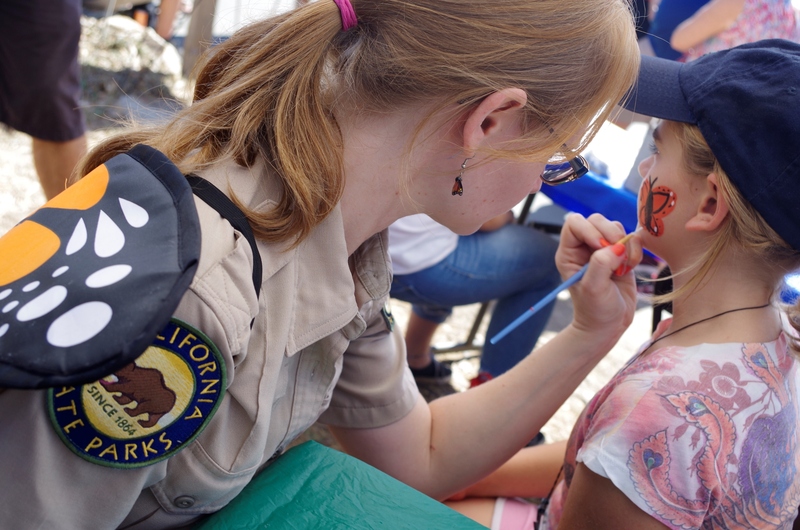 Event made possible by California State Parks in partnership with Portola and Castle Rock Foundation. Come enjoy a fun, family-friendly, festive day! This classic Santa Cruz tradition will kick off the Monarch butterfly season in style. We will explore the world through the eyes of a butterfly and discover how we can help the monarchs and their migration through our yards on their way to Natural Bridges for the fall and winter. Through activities, stories, games, crafts, song, parade, information booths and even food, we will celebrate these magnificent creatures that come to spend the winter at Natural Bridges State Park. Event free; parking is $10. For more information, please call (831) 423-4609. Event made possible by Friends of Santa Cruz State Parks and California State Parks. We're thrilled to announce the annual Open Streets Santa Cruz! This Santa Cruz tradition returns to West Cliff Drive on Sunday, October 14th, 2018. We'll be closing the road to cars between Lighthouse Field and Natural Bridges and invite you to join us as we walk, play, bike and dance in the streets on a day free from car traffic. Essentially a pop-up street park, Open Streets is fun for the whole family and will feature dozens of awesome local organizations hosting activities and games, live music, a raffle, and more! Visit scopenstreets.org for more details, and be sure to sign up to receive updates on this and future Open Streets events. Want to feature your business or organization at Open Streets? Visit scopenstreets.org/sponsor-an-event/ for more info and to apply! Fish, Fins, and Flukes Fall Festival is a one-of-a-kind community event for all ages. Guests will explore our marine lab's Science Showcase featuring unique science artifacts, our skull collection, and a whale of a skeleton (or two!). Family crafts, El Buen Taco food truck, and live music from The Singing Scientist complete the day. A special thank you to Long Marine Lab research groups! Check out unique science artifacts never before seen by the public! Students and scientists from the Long Marine Laboratory will showcase interesting props, specimens, or scientific instruments representing their research. Join Dr. Peter Weiss, "The Singing Scientist," and his rockin' band, "The Earth Rangers," for some danceable environmental education music. They sing about wildlife, plastic pollution, blue whales, cookin' with a solar oven, and much more. Dr. Pete, also known as a UCSC chemistry instructor, plays music that is danceable, engaging, and catchy. The Earth Rangers, with Gail Swain and Ron Goodman on vocals, Jerry Paul on bass, and Jeff Arlt on percussion, are a bunch of pros, and together with Dr. Pete, they will get the Seymour Center rockin'! Our adobe's story should have ended with 1989's Loma Prieta earthquake, but the right choices at the right times kept our story alive. Please join us for a snack from our restored cocina, look at how historical earthquakes affected our adobe and the people who lived here, the monumental work done to reconstruct our adobe since Loma Prieta, and the efforts underway right now to ensure our story continues after our next big earthquake. Event is free; limited parking (carpooling encouraged). Active construction site, open only during scheduled events like this. Events made possible by Friends of Santa Cruz State Parks and California State Parks. Catch a pumpkin, games, prizes, and a waterslide! We're putting a fun spin on the tradition of pumpkin picking by creating a patch in the pool just for you! In addition to pumpkins, we've got plenty of other fun activities planned for the day, including games, prizes, music, popcorn, and pumpkin decorating, and the waterslide will be open! Costumes are encouraged and there will be a costume contest and photo booth for those that dress up! Bring your suit and towel, your friends and family, and make a day of it! This is a drop-in, rain or shine event; pre-registration is not required. Please note: The floating pumpkin patch opens at 1:30. Only those picking out a pumpkin can swim in the pumpkin patch. Don't miss this fun fall family event at the Swim Center! Check HERE for the schedule of activities and admission information. The Santa Cruz Public Library System (SCPL) has announced a new ongoing STEAM program for kids set to begin on January 17th, 2018 and continue every third Wednesday of the month from 2:00pm - 4:00pm through May at the Scotts Valley Library. The program, called CASE Art, stands for Creative, Artistic, Scientific, Expressive. This new monthly class for ages 6-10 involves kids in art by using their own creativity while learning about the relationship between art and science. Parents are welcome to observe and learn, but the art is for the kids. At the first class kids will experiment with Zentangle Snowflakes. Every class will involve art and the science behind the art. "Learning about the relationship between art and science at an early way is a great way to get young children on the path to academic success," says Library Director Susan Nemitz. "And we have noticed that kids really enjoy learning from other kids." The class is led by Scotts Valley High School student Anna, who is in her junior year. She has fond memories of the art and craft classes at Scotts Valley Library when she was younger and wants to create similar memories for other Scotts Valley kids. Come down to Pleasure Point, check out all of our fantastic new shops, support and meet local artisans and have a good time! Pleasure Point has a new and exciting event to share! Every Third Thursday of the month from 5-8 pm, businesses will stay open for our community and feature local artists and makers. We will feature musicians and food trucks to create a lively atmosphere for families to enjoy. Come down to Pleasure Point, check out all of our fantastic new shops, support and meet local artisans and have a good time! There's an old saying that "the best time to plant a tree was twenty years ago and the second best time is now." There's an old saying that "the best time to plant a tree was twenty years ago and the second best time is now." The City of Watsonville is pleased to kick off our fall tree planting season with an event dedicated to climate action. Please join City staff and local nonprofit partners Regeneration-Pájaro Valley Climate Action, Watsonville Wetlands Watch, and Pajaro Valley Arts Council as we plant trees at Muzzio Park and work towards a healthier Watsonville on Saturday, October 20th from 9am - Noon. Materials, refreshments, and a free lunch for planting volunteers will be provided. Participants will learn about local ways to engage in climate change action, and will create art with Pajaro Valley Arts. Trees are a symbol for a strength and resiliency, and an indicator of communities that invest in a healthy and sustainable future. As trees grow, they help stop climate change by removing carbon dioxide from the air, storing carbon in the trees and soil, and releasing oxygen into the atmosphere. Once grown, the trees rooted at Muzzio Park will provide canopies of shade decreasing the effects of rising temperatures and keeping Watsonville cool. They will also support habitat for birds and create a refreshing resting spot for park visitors. **This effort is part of the Watsonville Urban Forest Revitalization Project funded by the California Department of Forestry and Fire Protection as part of the California Climate Investments Program. Get hooked on fishing at the 3nd Annual Dia de Pescar Fly Fishing Clinic. Bring the whole family and learn about fish and fishing in Santa Cruz County. Learn fishing techniques from the pros. Learn about the gear you need. Play fishy games, compete in casting and win awesome gear prizes. Learn about where to fish on the San Lorenzo River and Santa Cruz County. Learn from local fish experts about the fish in our river and in the Monterey Bay. Learn what you can do to protect fish. Have you seen people fishing in the river and thought, how cool! Well, this is your chance to give it a try! No gear or prior experience necessary. This event is organized by Santa Cruz Fly Fisherman Club, Steinbeck Country Chapter of Trout Unlimited, Monterey Bay Salmon and Trout Project and Patagonia. Free water education event in the park! Need to complete community service hours? Want to help out at a great event celebrating water? The RCD, Soquel Creek Water District and Santa Cruz County Parks Department are looking for volunteers for the Water Harvest Festival on Saturday, October 20th from 12-3. Various options available. Visit the web site to complete the volunteer form and choose an activity that you would like to help with! Women on Waves Surf Contest is a day to celebrate the Santa Cruz female surfing community. Girls and women will show off their surfing skills in a friendly competition and for a great cause, The Wahine Project, a nonprofit organization that promotes a diversity of girls having access to ocean sports who would otherwise not have the opportunity. Come out, show your spectator support, and enjoy live music, a high quality raffle, surfboard raffle, unique photo opportunities, and local vendors. The Santa Cruz County Animal Shelter provides after-school clubs for two age groups (1st - 5th & 6th - 12th grades), encouraging and supporting the young animal lovers in our community to learn and grow as compassionate stewards. Membership is required and space in the Clubs is very limited so sign-up today! If there are fewer than four registrations for any month, there will be no Club and refunds will be issued. All registrations must be completed the week before Club for that month begins. Refunds are only offered is Club is canceled. What: Students learn about animals and do projects to help the Shelter pets. Click here for further information and to register! What: Youth volunteers learn about animals and animal welfare, help pets during their stay at the Shelter, and earn Service Hours. Experience the haunted tale of Big Basin's last lumber mill owner and his fateful encounter with a grizzly bear! History takes a tall tale twist as the saga of this early pioneer unfolds. The silly, slightly haunting tours around the redwood loop trail begin at 7 pm. Enjoy the redwoods on a fall night with music, storytelling and "Ranger Apples" around the campfire. All participants must register at Park Headquarters (registration opens at 6:30 pm). GLOW is a festival featuring the very best fire and digital artists in Santa Cruz County. It's like a little bit of Burning Man came to Downtown Santa Cruz. Explore Cooper Street as it fills with fire dancing and art. Get up close to flaming cannonades, sculptures and live DJs in Abbott Square. Get hands-on in the electrified Santa Cruz Museum of Art & History (MAH) with interactive digital art, projections, and LED sculptures. Join us for an exciting musical parade as 55 Northern California high school and junior high school marching bands compete next to the iconic Santa Cruz Beach Boardwalk in the ONLY band review with warm sand, cool surf, and hot rides! Marching bands will be judged in categories such as music, showmanship, and marching. Celebrate! The harvest is in! See tractor, draft horse, and living history demonstrations, listen to music, make crafts, and participate in harvest-time activities. This event is appropriate for all ages. Bring your family to the Harvest Festival at Boulder Creek United Methodist Church on Saturday October 20th. There will be games a face painter a bounce house and a pumpkin patch, as well as good food, good people, and all around good times. Looking for a place to belong? We are now accepting 2019-20 applications for grades 6 - 12! With an average class size of 12 students, a full range of AP and honors courses, intensive study paths, and a world-class faculty, Kirby students are challenged based on interests and readiness, not grade level. Please join us at our Open House to learn more about how Kirby supports, engages, and challenges every student in our care. We will begin with a Meet and Greet, followed by a more formal presentation, a campus "passport tour," and a closing reception. Learn more about our school, talk with Kirby families and faculty, and see our campus in action. We look forward to seeing you there! Come celebrate the opening of the pump track at Pinto Lake County Park! Supervisors Greg Caput and Zach Friend invite members of the public to a ribbon-cutting for South County's first pump track at Pinto Lake County Park. To be held Monday, Oct. 22 at 1:30 p.m., the event will celebrate a new recreational opportunity for South County youth. While Santa Cruz County is known as a global mountain biking destination, there are few resources for Pajaro Valley-area youth interested in the sport. Santa Cruz County Parks, A & C Grading, Action Sports Construction, Boulder-based People for Bikes and Mountain Bikers of Santa Cruz County were major partners in the project. The Resource Conservation District of Santa Cruz County, City of Watsonville and Watsonville Wetlands Watch also contributed funding and expertise. Includes: pizza, a pumpkin for carving and a spooky project! Plan an evening out for yourself and leave the kiddos with us! We will explore the art of pumpkin carving with lots of fun examples and demos. Kids will have pizza, do a fun spooky project and will carve their own pumpkin! PRE-REGISTER: $45 per child - Call today! Contra dancing for beginners and experienced dancers - Make dance magic happen on the dance floor! This dance will feature gender-neutral dance roles (larks/ravens). They're back, by maniacal demand! THE SANTA CRUZ CONTRA COMMUNITY NEEDS YOUR HELP! Running two dances per month has more than doubled our workload. This presents an opportunity for those with as little as one hour per month to contribute to the ongoing success of this endeavor. We need volunteers to help with a variety of organizational tasks. Please contact the board at volunteer@santacruzdance.org and one of us will get back to you. please note the change in LOCATION AND TIME for November 11. Sunday, November 11, 3:30-6:30 pm at Live Oak Grange! Yoyo Zhou calls to Countercurrent from Seattle. Friday, November 23, 7:00-10:00 pm at Live Oak Grange. Claire Takemori calls to a band TBD. Bring a snack to share if you have one. Help support our community -- invite a new friend to experience contra dancing! Making the second monthly dance sustainable has more than doubled our workload. This presents an opportunity for those with as little as one hour per month to contribute to the ongoing success of this endeavor. We need co-managers who will help set up or close the dances with other volunteers. Please contact the board at volunteer@santacruzdance.org and one of us will get back to you. Our next board meeting is Tuesday, January 8, 7-9 PM at the Louden Nelson Community Center in Santa Cruz. We invite you to visit our meeting and consider whether you would like to join us. Monster comedy adventure - wicked good fun! Bring your family, chairs & blankets. Come in costume and get a treat! The Open House will feature an elementary garden party, with opportunities to meet teachers and tour the campus. The Open House will feature an elementary garden party, with opportunities to meet teachers and tour the campus. MMS has small class sizes and learning that goes beyond the classroom walls, a Montessori-influenced Pre/K and college prep 1st-12th grades. Featuring project-based science labs, outdoor adventure, travel, marine biology and oceanography studies on Catalina Island, national and international travel, mixed-grade buddy program, visual and performing arts. RSVP to Benna Dimig at 408-846-4042 or admissions@mountmadonnaschool.org. Ghosts, goblins, boys and ghouls...join us for the annual Capitola Village Halloween Parade! Ghosts, goblins, boys and ghouls...join us for the annual Capitola Village Halloween Parade! Line up begins at 1:30pm in the Beach & Village Parking Lot above Capitola City Hall. Parade begins promptly at 2pm. Parade will head down Capitola Avenue, wind through Capitola Village to the Esplanade ending at Esplanade Park, where trick-or-treat bags, balloons, and refreshments will be waiting. New Leaf Community Market will be there with treats! Trick-or-treating at Capitola Village shops following parade. Have you ever played the board game clue? Come to the MAH and play a live action version for a thrilling and riddle-packed Murder Mystery Game Day. Unravel who murdered notorious Santa Cruz private investigator Harlow Lindsay through a series of clues and activities. The clues will lead you to the weapon of choice, the location of the crime, and the murderer. This is a free, drop in event for all ages created with the Santa Cruz Public Libraries & Editor of Santa Cruz Noir, Susie Bright. It's time to get your Halloween costume AND running shoes ready! Watsonville PAL is hosting a 5K Halloween Run on October 28th at Pinto Lake County Park. You can join the fun for just $30! Plus, all kids under the age of 12 can participate in a FREE 1K FunRun. By signing up, you're helping PAL kids and teens better themselves and become positive role models in our community. Your help allows us to continue to offer crime prevention programs for students who are the future of tomorrow. -5K start time is at 8:30 a.m. and 1K at 8:15 a.m.
Join our cause. Register today. Bring the kids, the neighbors, and even the dog for this annual free family friendly event in Downtown Santa Cruz. Pacific Avenue will be closed to traffic, and the downtown merchants will be handing out treats to costumed kids. Whether you're spooky or sparkly, creepy and crawly, or cute and cuddly, wear your most creative costume and bring your camera to this fun, safe and free annual community celebration. Fern Creek RR Invaded Halloween Night! Lights, fog machines, jumping spiders, the grim reaper, haunted scare crow, not to mention flying ghosts and other ghouls! The Fern Creek and Western Garden Railroad is open to the public on Halloween night. All are welcome to come and watch trains run around the garden. Tell your friends and family to join in the fun and we hope to see you there!